Perfect apartment for the whole family. In front Of The pool. Balcony with BBQ. Dining area and living area with TV. Fully equipped and very big kitchen. Air conditioners in all areas. 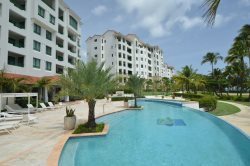 Guest have access to all the amenities at Vereda del Mar. Municipalities in this region are: Maunabo - known for its 19th Century Punta Tuna Lighthouse (still in operation); Yabucoa known as sugar town. Among Yabucoa’s attractions is the old Hacienda Santa Lucia. Humacao is the largest city of the region and host of major hospitals, university campuses, shopping centers, and Palmas del Mar community. Las Piedras, known for its craft’s artist and indigenous rock carvings. Juncos, “Ciudad del Valenciano” or the City of the Valencians (from Valencia, Spain) offers great Puerto Rican cuisine. Naguabo has the best seafood of the region. Ceiba counts with the Ceiba Forest a popular attraction for hiking and fishing of marlins. Fajardo has the largest marina in the Caribbean; it is also the town where you can catch the Ferry to Culebra & Vieques Islands. Fajardo is the place for most of the scuba & snorkeling excursions and sailing trips. Luquillo is best known for its Blue Flag Luquillo Beach. Rio Grande is a golf resort destination as well as home for El Yunque Rain Forest. Loiza is known for Piones, a cultural hectic area and gastronomical route for Puerto Rican favorite’s plates. Loiza is also home of famous surfing beaches: Chatarra and Aviones. Canóvanas has Camarero, the only thoroughbred racetrack in Puerto Rico. Culebra & ViequesCalled the “Spanish Virgin Islands”, Culebra & Vieques are among the most exotic places in the Caribbean. Both Islands share spectacular sunrises and sunsets; crystal clear water beaches and both are considered hidden natural treasures. These Islands share a history of being used by the United States as locations for military practices. Culebra was a USA military territory until 1973 and Vieques until 2003. Now both islands have great part of their land under United States Wildlife Services. Specifically Vieques has become a nature preserved island. If you want to experience a truly great escape, you must know that Vieques just won the Reader’s Choice of Best Tropical Island Escape according to the Travel & Leisure World Best Awards. You can watch the video here. Bioluminescent Lagoon (Laguna Grande). Fajardo. Punta Mulas Lighthouse. Vieques. (787) 741-0060.